Lawyers who like to get worked up over unimportant issues often grow contentious in their opinions over whether to put one space or two spaces after the period in legal documents. Many lawyers are sharply divided on this issue, with opinions often breaking along generational lines based on when the lawyer originally learned how to type. 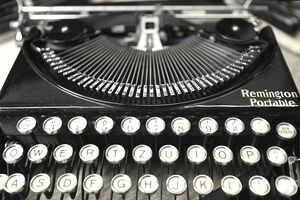 Many lawyers like myself learned to type on ancient manual typewriters in a high school typing class and had the two-space rule drilled into their minds and their muscle memories. Younger lawyers who learned to type exclusively on computer keyboards are much less likely to have acquired this habit, especially if they never took a typing class since the double space is not really needed in computer-generated documents (with the exception of a few monospace fonts that copy the old typewriter styles). Some of the debate is being driven by the publication of Typography for Lawyers by Matthew Butterick. Butterick is an advocate for improving the appearance of legal writing by adopting more attractive and modern typographical practices, rather than clinging to the unattractive writing styles of the past. One of his recommendations on improving legal documents is to eliminate the extra spaces. He explains that the use of two spaces between sentences derives from when everyone was writing on manual typewriters. Due to how typewriters handled proportionate spacing, it was easier to read typewritten documents which placed two periods between sentences. Now that everything is written on computers using fonts that do not have the limitations of typewriters, documents are now more readable if there is only one space after the period. Many non-lawyers are debating the spacing issue in the context of other forms of writing as well. An article by Farhad Manjoo on Slate.com complained that two-spacers are both wrong and annoying in their insistence that they are right and insists that everyone should write the way typographers say documents should be written. In a scathing response, David Wynn Miller at ManifestDestiny.com said that "on questions of aesthetic preference there’s no particular reason that normal people should listen to a bunch of geeky obsessives who spend orders of magnitude more time on these issues than average." More directly to the issue, Miller said that the two spaces after a period have a "mathematical beauty" that makes it easier to read. Endorsing Wynn's viewpoint, Megan McArdle at The Atlantic concisely stated why most lawyers continue to be two-spacers. McArdle said, "I double space because I learned to type on a manual typewriter, and it's not worth the effort to retrain myself." Lawyers who believe it would be too much effort to retrain themselves to become one-spacers are underestimating themselves. Of all the challenges a lawyer faces on a daily basis, resisting the urge to hit the space bar and extra time is not much of an obstacle. If you learned the rule against perpetuities in law school, surely you can manage to stop hitting the ​spacebar so much. It just isn't that hard once you decide to do it. If you prefer the appearance of documents with two spaces, then you aren't going to be motivated to change the habit. But if you spend a little time comparing one-space documents with two-space documents, you'll probably realize that the one-spacers have a point. Two spaces are no longer necessary in modern typography, and they now detract from the appearance of legal documents. And if aesthetics don't sell you on the idea, then consider how much paper is wasted by the cumulative effect of thousands of lawyers adding thousands of extra blank spaces on thousands of legal documents every day. Want to save the rainforests? Then stop wasting all that extra paper on blank spaces.